Rocking it with the MASSIVE VOODOO Camp - bongo bongo - and your about to smell what the Kong is cooking... finally! After Picster told me about a competition over at the enourmous Warhammer 40K Space Marine platform, 'Bolter and Chainsword' about painting a Space Hulk Terminator in traditional Blood Angel chapter colour scheme or a following Chapter i thought about taking part, as i wasn't able to get hold of the Space Hulk game because of whatever, i asked a friend of mine if maybe i may get one of them i really like. In the end after a million times asked he decided to give it to me - thank you very much, my Kurtheit. After this i took one of the GW inks, Badab Black with a tip of Dark Flesh and inked the red parts with it to get some depth to work with. 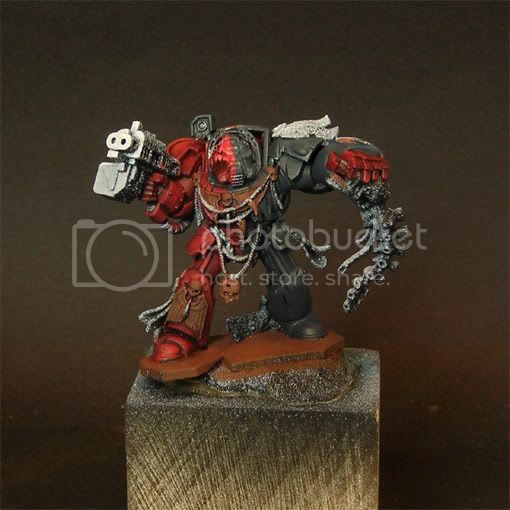 Also i painted the other half of the Terminator in Black. I didn't use pure black here, because in my eyes it is a bit too intensive and doesn't look natural. I did put in some ice blue in chaos black to get a good basic tone for the black armour parts. To the top i put more ice blue in it, it is very subtile but while working it out i hope you will get what i mean. The skulls/eagle wings have been painted with a basecoat of dark flesh. 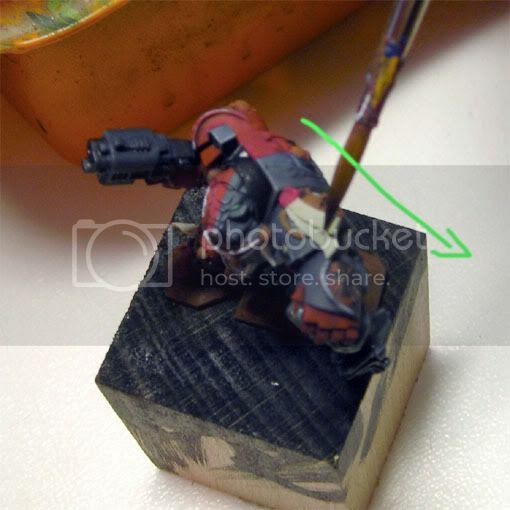 As you can see the model is just put on top of a wooden piece to get a better hold while painting him... Want to know more? 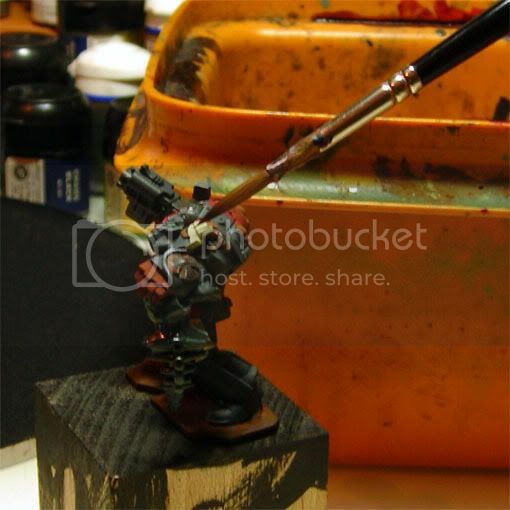 As the base has been basecoated with Dark Flesh i just put it up there with some water on an old brush. I next put my attention on the Purity Seals, which i basecoated with 2~3 Layers of Rotting Flesh. The Genestealer rests have been painted with a basecoat of Chaos Black +Regal Blue + Dark Angels Green and have been highlighted wet in wet with adding some grey and as far as i can remember a bit of Bleached Bone. His teeth got painted with Dark Flesh. The stormbolter was painted in chaos black + ice blue, which i still got on my wet palette. Now, think, Roman think... uhm japp - a tip of white has been set in the Rotting flesh to highlight the Purity Seals a bit. Pure white was set in his intact eye. Pure white was used to paint those belt/stripes honour things he got hanging around there. The latest black mix was used brighter on the edges by adding a tip of pure white. 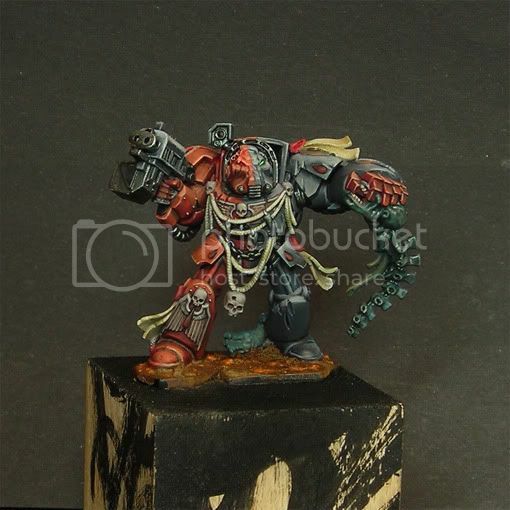 The red things from the Purity Seals have been done with a basecoat of Red Gore. 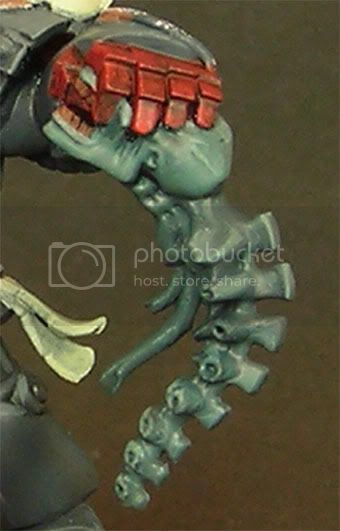 The Genestealer's teeth have been highlighted with a tip of white. The whole Genestealer rest has been washed with 510 Gloss Varnish from Model Colour with a tip of Chaos Black in it - also added water. 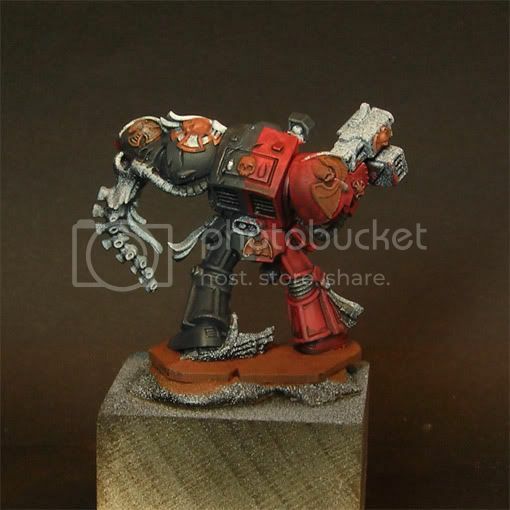 The Crux Terminatus has been basecoated with pure white and was washed with Badab Black. Also every blood drops and later gems have been basecoated with pure black. Ah ya, i have switched the wooden socket, because there will be added some more stuff after the comp. As i am trying not to forget something about him, i will show you here some more steps further, still in the progress of finding my way through the miniature - it is still early progress on him... so be patient about this step by step - looking forward to the end, because i still don't know yet how he will really look afterwards, haha! 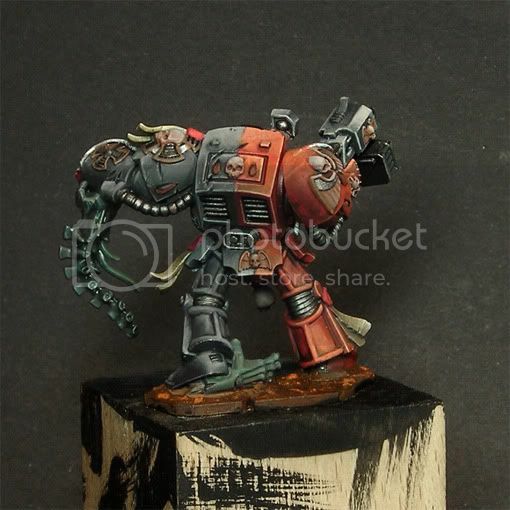 The reds have been brought a bit more brighter with using a tip of Fiery orange in the basecolor, added some Dwarf Flesh in it for a subtile Highlight on the edges... red is a bad color it mostly goes up to pink, so don't highlight with pure white or something near this. The metal parts have been set with a dark metal tone of Vallejos Oily steel 70865 + a tip of Chaos black. 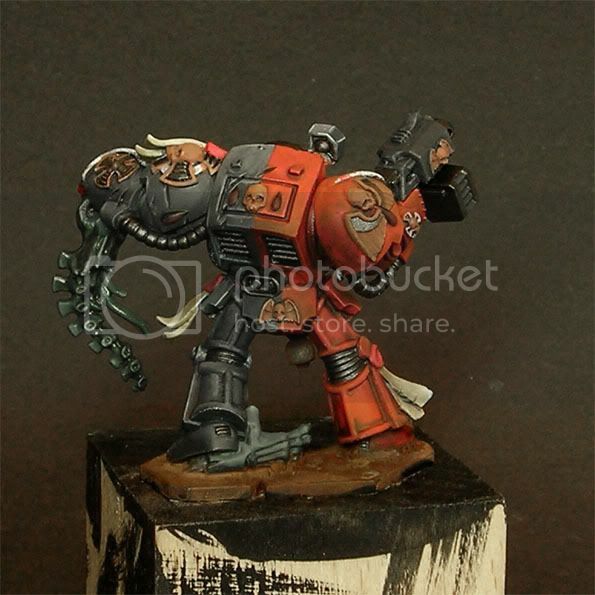 The Skulls and boneparts in the end have been highlighted with a tip of Codex Grey in Dark Flesh. More to come here soon, very subtile. 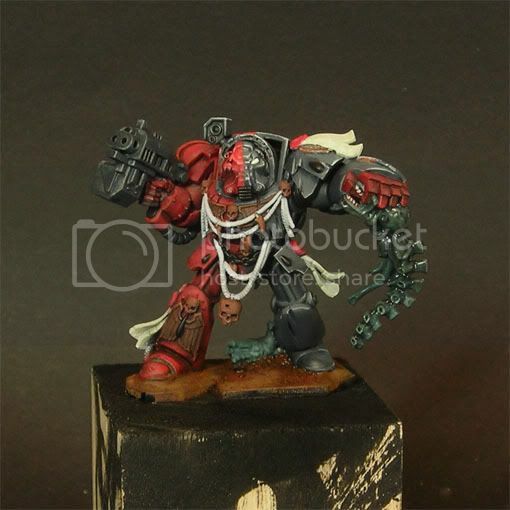 The red wax dots of the Purity Seals have been darkened with a mix of Scab Red + a tip of chaos black, also did use this mix for some more intensed shadows on the red armour parts. The Skulls and bone parts have been highlighted with thin glazes of Codex Grey adding a bit of Bleached Bone for going a bit brighter (not finished this step overall, because i am working my way from skull to skull, so some have more layers, others less at the moment). 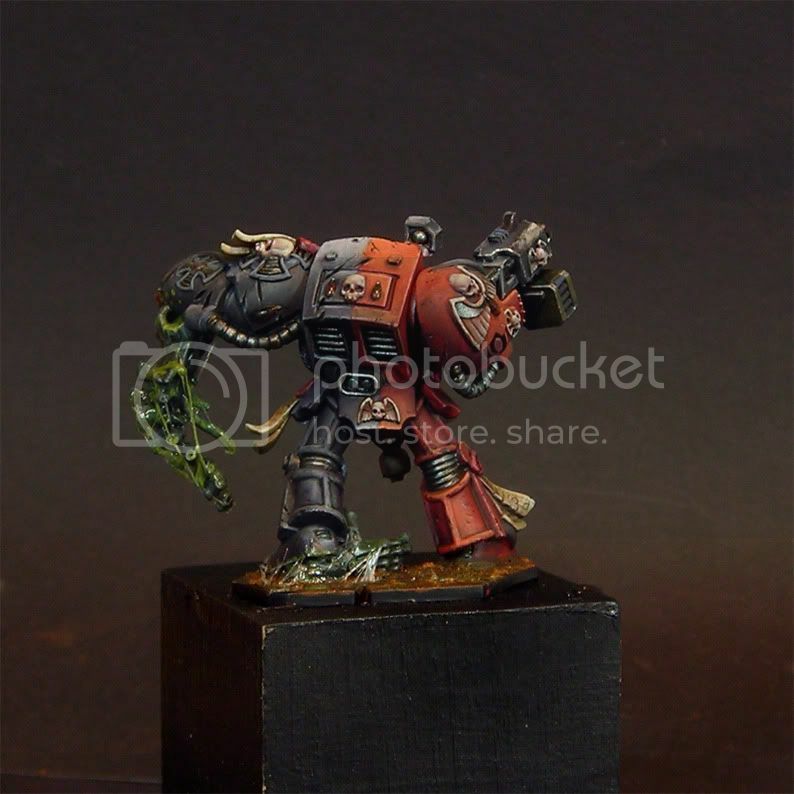 The black armour parts have also been highlighted with this mix in the places where the imagined light from above hits the armour. 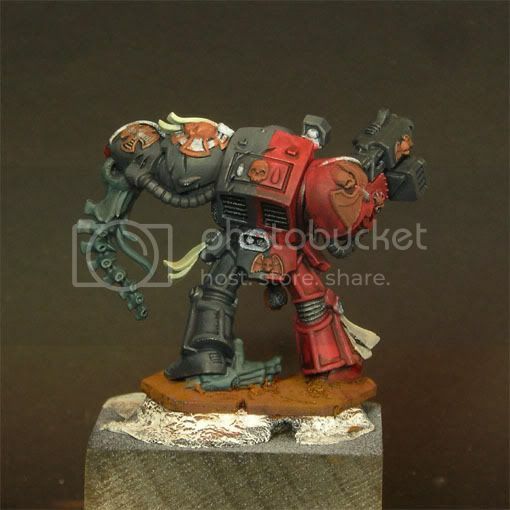 Also the 'box' around the stormbolter has been worked with this colour. 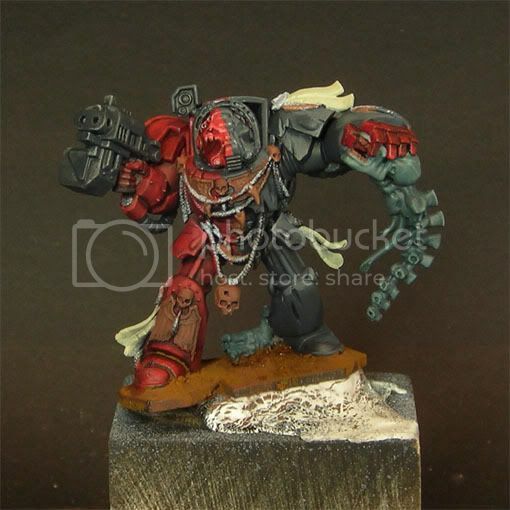 The red armour parts have been highlighted with a mix of Blood Red + Tip of Dwarf Flesh + Tip of Bubonic Brown, also some edges get some attention with this mix. The gems have been strengther in their lower part with 2 glazes with pure Blood Red. 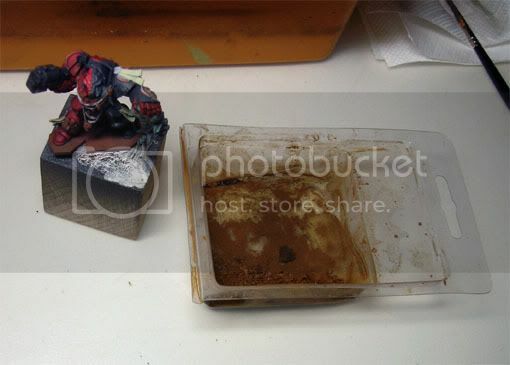 The metal parts have been slowly highligted with glazes of pure Oily steel from Vallejo (70865). On the base i have added some more rust, done with the same pigments as before but mixed with vermin brown to get some natural difference to the rust. 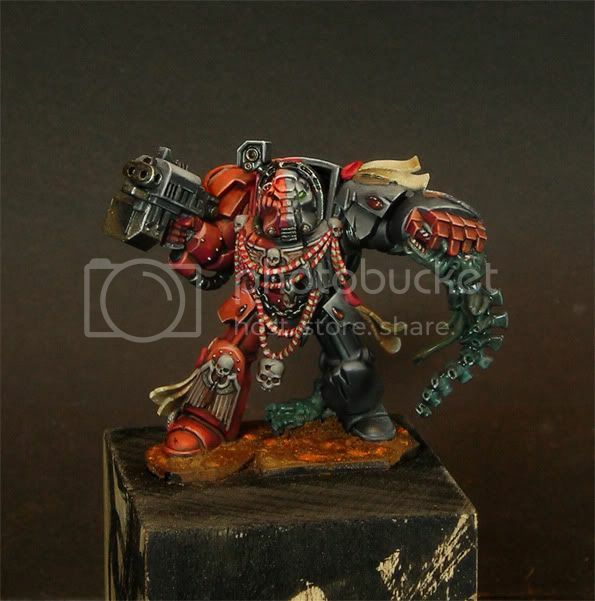 The alien teeth around his "honour snake thing" there over his chest have been painted the same like the genestealer before. The gems have been highlighted in the lower parts going from red to orange and a tip of yellow in the end. Trick here was mixing Vallejo's Gloss Varnish 510 Model Colour in the colours i use for the highlight, so the shiny intensity became much stronger and it is easier to handle in my eyes. Didn't try it with another Varnish because it works really well with this one - up to you to catch some experience. A white tiny dot has been set on the upper side of the gems - take care of different lying gems as the white dot appears where the light source hits the game - in this case from straigt above. The black armour parts have been darkened with thin glazes of Chaos black to get it more darken. Use the brush as described above for this reason. Detail edge highlights have been set with elf Flesh on the reds and Fortress grey on the blacks. Also the red parts have been more intensed by using thin glazes of Fiery Orange on the areas where i imagined light to fall from above. 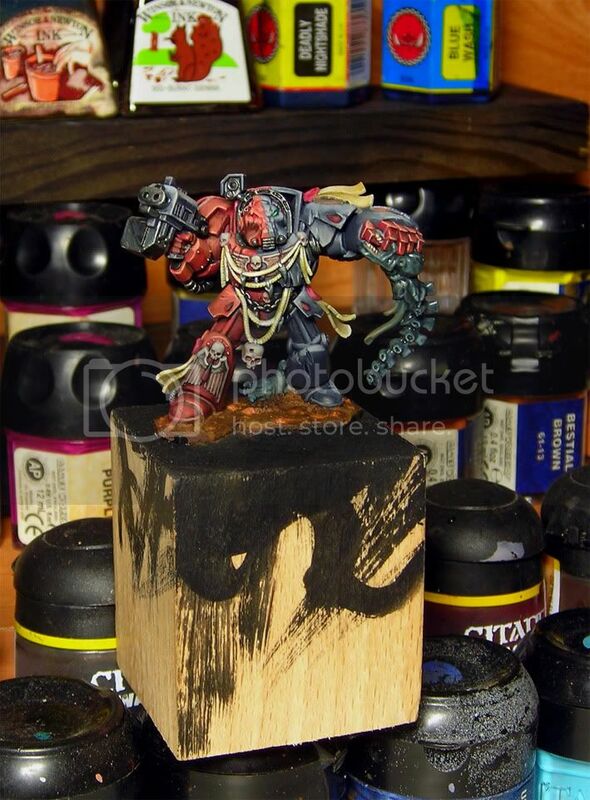 I have used thinned Chaos Black to "draw" black lines in the places where different parts come together - to make the miniature look more sharper and clear the view on different areas. The purity seals have been darkened with glazes of bestial brown to bestial brown with a tip of chaos black in it. The little lamps on this lamp-thing over his helmet on his right have been painted black. The green of the eye has been intensed a bit more with 2~3 more thin glazes of Bilious Green. Ok, now i got my mess - i have made green glibbery strings and slime from the aliens corpse and now the eye of the terminator is struck down in its focus... ahhh.... i have changed the eye to a simple blue, ice blue on regal blue but somehow i am not satiisfied with the eye in the end. The glibbery slime on the alien has been made with this technique. The candy snail has been painted very dark in a mix of chaos black and ice blue, highlighted over bleached bone to a tip of white in the mix at the upper areas. Little damages in the armour have been made using an old toothbrush and chaos black - a detailed view to this so called "damaging or weathering" will be find sooner or later here on MASSIVE VOODOO in the Painting Tutorial Section. The blacks have been darkened more with a couple of thin glazes of chaos black to make the greyish looking areas get more into a black, BUT with areas where the light from above hits the armour. 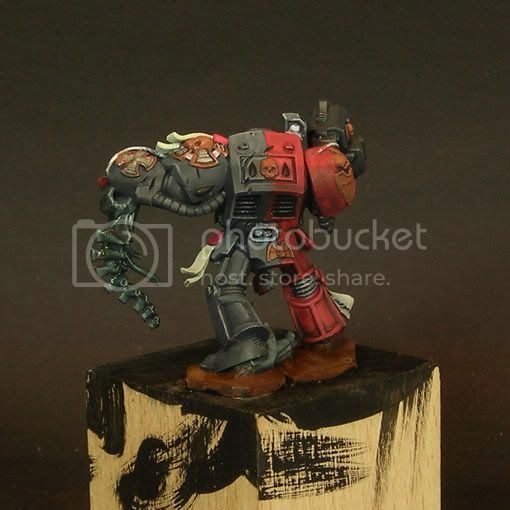 Reds have been glazed the same only with glazes of a dark red, made by a mix of chaos black and red gore. 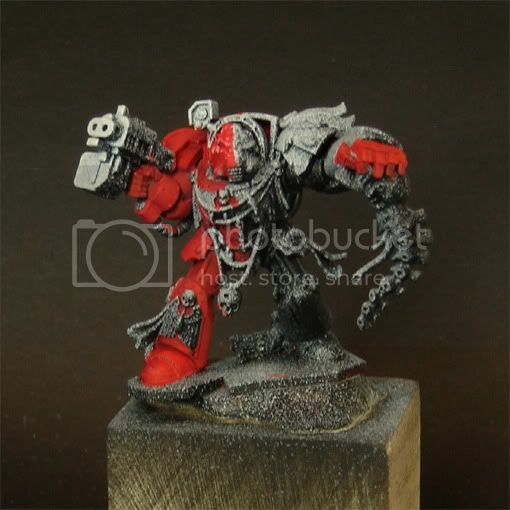 The wax dots of the purity seal have been shaded with thinned Tamyia clear red x-27 and as far as i can remember i did use this glaze also on the red armour parts. The metals have been highlighted with pure mithril silver on the edges and the areas where the light hits the areas. The areas which the light won't hit, have been darkened a bit more with thin glazes of chaos black to maximize the contrast in the metals and make them look more alive. The skulls and bone parts got their last highlight with thinned skull white mixed 50/50 with bleached bone. Also the purity seals did get a final highlight with this mix. The "text" on the purity seals have been made freehand with a mix of schorched brown and chaos black, thinned with water a bit to make the colour more fluid (just do this always i hear me say) and make the "freehand" drawing more easier. 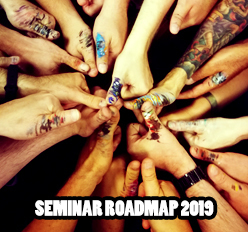 I hope this tutorial helps even it sounds weird in some areas... not really easy to get it all written down... ay, ay, ay... whatever - Keep on happy painting! Great write up! One of my favorite tutorials I've read. I know this is different for each artist, but when painters say a "tip" of a color added, is it just enough on the brush tip mixxed in to visibly change the color slightly? I ask, because black is more frustrating for me to paint and I have tried to change it slightly by adding blues, or browns to the base color I use and I either add too much of the color making it look not so black when I finish, or so little of the "tip" color that I can't really tell if I changed the black at all. :) Probably a fine line that you learn with experience? 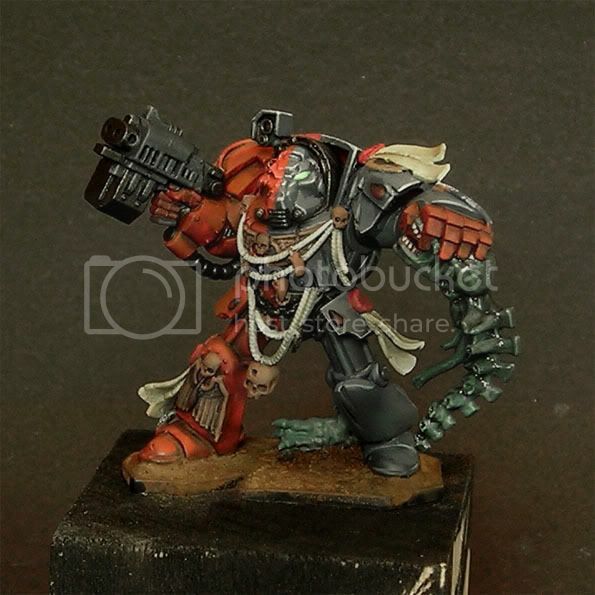 Also, when you glaze over your black areas with chaos black, is there a reason you make a glaze of chaos black instead of using the badab black in a similar way? Do the two different methods produce different results? Thanks again for always sharing your happiness! I just wanted to thank you for all you awesome tutorials! 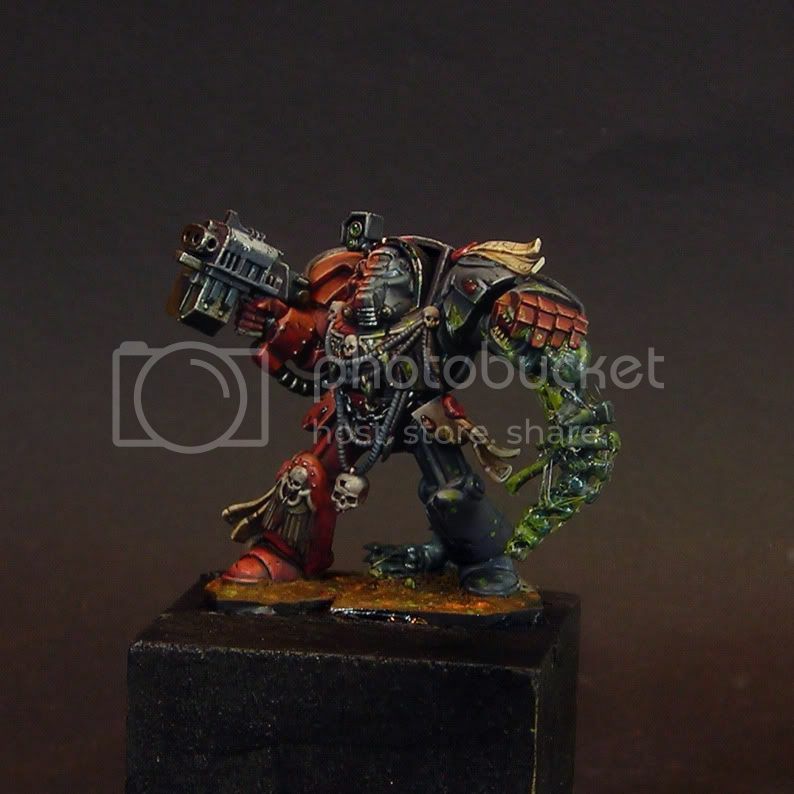 I have been painting the same terminator over the past weeks following your updates. 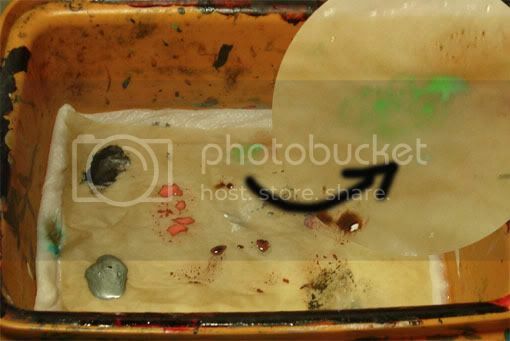 I even made a wet palette, and I have to say that I've never had so much fun painting! 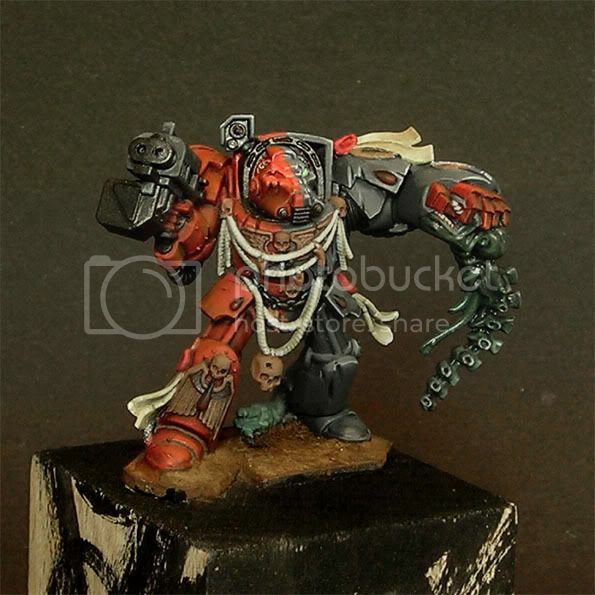 I just primed Gideon (another Space Hulk terminator) and I'm looking forward to start painting him up. Congratulations with your deserved win on Bolter and Chainsword! Keep it up and thanks again! Thank you very much for your comments on this one - such comments are the reason why i am trying to help, having the energy and happiness to do so... thanks a lot, very appreciated. "I know this is different for each artist, but when painters say a "tip" of a color added, is it just enough on the brush tip mixxed in to visibly change the color slightly?" Sure this is a very undefined indication, sorry about that. It is exactly what you did write! "I ask, because black is more frustrating for me to paint and I have tried to change it slightly by adding blues, or browns to the base color I use and I either add too much of the color making it look not so black when I finish, or so little of the "tip" color that I can't really tell if I changed the black at all. :) Probably a fine line that you learn with experience?" Oh yeah, i hate black too - but since i did add different tones to it, like those you described and for sure others (always something new for experimental weirdo style) i am slightly starting to love painting black. 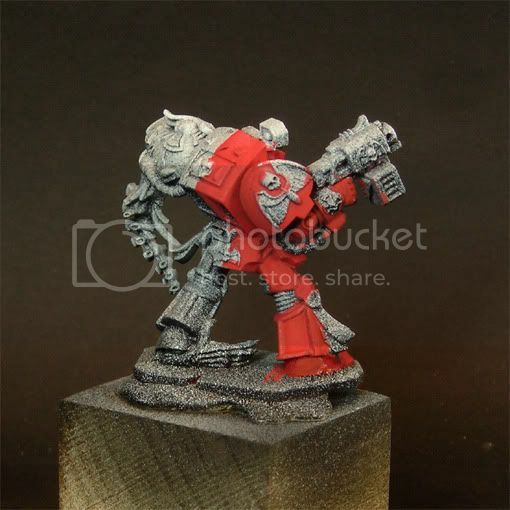 I use a tip of one of those colours into the black for a basecolour, i do not change this anymore by bringing in more of the blues or whatever colour you have added, i simply highlight it as i would have been highlighting only black, with codex grey, bleached bone, space wolfs grey, skull white in the end... just for examples. This won't change the effect of a intresting black by bringing it too much to another colour. The added colour is just more realistic, because in my eyes there is no pure black in nature, there is always some colour playing in it, for example from a light source as the sun, etc. 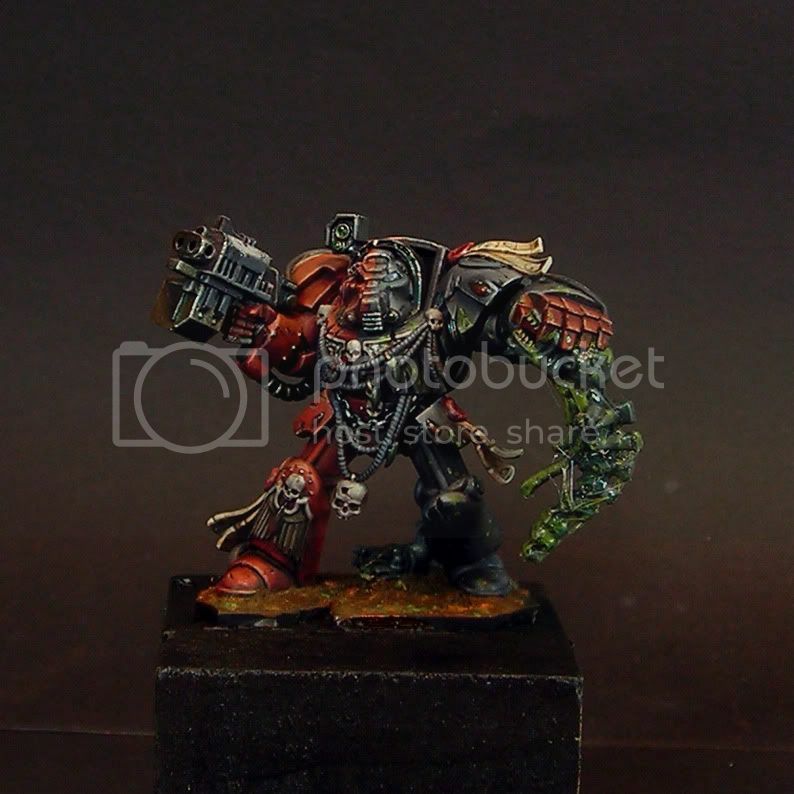 "Also, when you glaze over your black areas with chaos black, is there a reason you make a glaze of chaos black instead of using the badab black in a similar way? Do the two different methods produce different results?" You are absolutely amazing! I want to be like that!